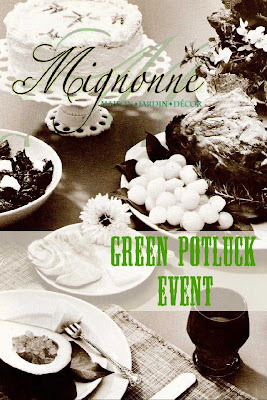 Potluck Party at Mignonne ~ Save the Date and Shop Green! Mignonne is a committed member of Oakland's local merchant community. We support sustainable commerce through our extensive collection of vintage tableware and decor (reuse) and refurbished vintage furniture pieces (recycle/reuse) created through the vision and artistry of co-owner, Johnelle Mancha. We are excited to bring you one of our popular customer receptions that capitalizes on these two concepts. We have teamed up with 2 Twigs ( Alameda ) a sustainable florist who sources local yards to create incredible bouquets, and with Gina Pericini of Flock, a local designer who creates handmade silk-screened kitchen towels, cocktail napkins, and pillows to bring you a "Green Potluck Event" in our store on Saturday, September 6th. The Green Potluck Event will focus on the sustainability of selecting and re-using vintage house/kitchen ware and buying locally. During the Green Potluck Event you will be able to see Mignonne’s large assortment of vintage/antique dishware in use while you nibble on small selections from Oakland's local and sustainable restaurants and bakeries from Old Oakland, West Oakland, Temescal and Uptown. 2 Twigs will be designing centerpieces to inspire your imagination as you plan for your next party, entertaining guests or general decorating projects. We will also feature Flock's arrangement of entertainment accessories. We'll be providing more updates between now and the 6th. Mark your calendars and plan to join us in preparation for the upcoming fall and winter entertaining season. As summer winds down and we move indoors, we begin to think of refreshing our décor and designs. Mignonne is here to provide you affordable options to update your home for the new seasons. Sweet French Baby Bibs now at Mignonne! Adorable bibs just in from France! Now you can "French-ify" your little one or bring some international culture to a baby near you. Durable white terry bibs trimmed in gingham with darling phrases of your choice. Stake a claim for papy or mamy or just general around sunshine of our hearts. Wash in cold water, ships worldwide. Use contact feature on the blog for more information. Diana Blackwell makes monoprints and monoprint collages with bright colors and a whimsical flavor, often depicting ladies and flowers. In addition, Blackwell does drawings, acrylic paintings, woodcuts and linocuts, collage, paper mache, and digital photography (see www.flickr.com/diana_blackwell/). Blackwell's work has no typical style and expresses no particular vision. 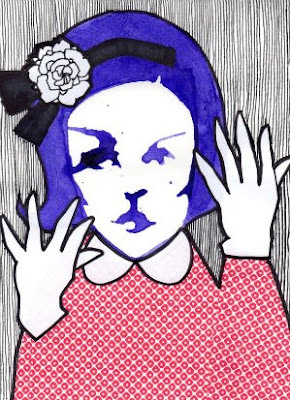 Her work ranges from obscene underground cartoons to devotional Christian paintings, and from non-representational formalism to traditional realism. About the only thing her works all share is an avoidance of impasto. Blackwell has had a little formal art instruction but is mostly self-taught. She works as a figurative art model and publicist with the Bay Area Models Guild. She lives in Berkeley with her husband and two cats. 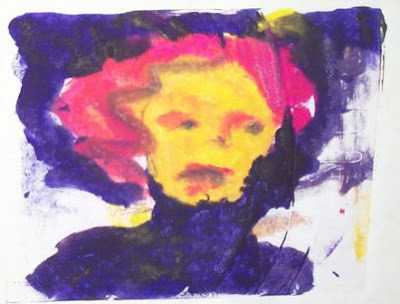 We find Diana's work evokes a sense of the strong female spirit with an ethereal aesthetic. "I am a self-taught artist aspiring to be a linguist. Born in the South Bay, and raised in the Easy Bay, people watching, jazz, and the extremities of life have greatly inspired my work long since the days of my tender infancy. I have been drawing for as long as I can remember. I would sit cross-legged before a stack of scrap-pieces of paper on top of this tiny-haggard coffee table, and I would literally draw for hours at a time. Like Mignonne and its two owners, I have submitted myself completely to the francophile community. I am studying French in school, and I plan to one day live there. I am however open to more than just France, and as as an absolute linguaphile, I plan to one day expand my horizons and exercise the modest albeit growing knowledge I have of other languages. My goal is the learn as many languages as I possibly can and utilizing them in all of the world's 195 countries, leaving behind meaningful traces in my name. Watch out for my flags on mountaintops, world!" We loved the youthful exuberance of Paige's art and were excited to share it with the Mignonne community! Both artists will be featured in a Friday night late hours reception during the upcoming Oakland Art Murmur. As a gentle reminder, the Oakland Art Murmur event features a group of galleries and boutiques in Oakland that have openings every first Friday of the month. We are proud to feature the original works of these artists at affordable prices that make owning an original piece attainable for our customers. Feel free to stop by the shop, or use our blog contact feature to get more information. More French Finds on their way to Mignonne! For you collectors out there... a very nice selection of antique French tins, including Pastilles, Mucilage, lozenges and medicinal purposes. A fun and decorative touch for kitchen or bath displays. Also, another set of carafe and matching digestifs seen below. All are in transit to the store and should arrive very soon. Stop by and check them out in person, if you can! There are a number of sources available in seeking out French finds. Like many things in France, there are different terms with subtle differences (some I have yet to figure out!) which will help you determine what to expect with a visit. 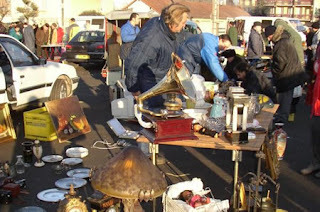 Marchés aux puces, Brocantes, Antiquités, Vide Greniers, Trocantes. All are places to visit when looking for used French items. How old and how used can some times be predicted by the names. Antiquités indicates shops which should house at least SOME veritable antiques. Not the American version of antique (greater than 50 years), but true antiques dating back a ways in French history. Brocantes are permanent shops selling a mish-mash of decorative items, old and used … but the age can vary greatly. Marchés aux puces are flea markets, typically reoccuring in the same location, like other marches for food, etc. An example can be found at the Porte de Clignancourt in Paris. Trocantes are second hand stores that offer not only décor items, but other useful things like used stereo systems, garden equipment, etc. Lastly, I mentioned Vide Greniers. 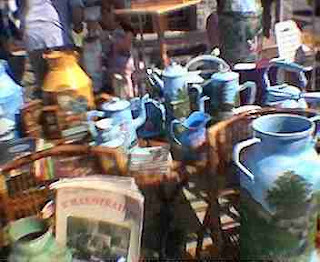 A vide grenier is the equivalent of a British car boot sale or an American flea market. The term Vide Grenier means attic clearance. Vide Greniers move about and every village of a decent size usually hosts at least one per year. The event attracts stall or space holders from the region only. Just like in the states, the sellers are a mix of those who do this for a living and who have intimate knowledge of their goods … on down to village folks who really are just clearing out the attic (from these sellers you just might score a bargain. The village usually also hosts refreshment stands during the event … a chance to earn a little extra money for the city coffers as well as for attendees to sample local fare. When a village hosts a brocante, the stalls are found in the main plaza and can also stretch throughout side streets, etc. You will find everything from children sitting on blankets selling their own toys to bric a brac, antiques and collectables dealers selling their wares and of course any amateur who wants to set up a stand.Vide-greniers.org is a site that tells you where the brocante fairs and vide-grenier sales are happening in the Dordogne. The French call antique-hunters "chineurs". "Chiner" means to hunt for antiques. Brocante fairs began as a means to offer itinerant traders the opportunity to open up stalls where the local people would see things they couldn't find nearby. That's the way things still are in the Dordogne. The traders at antiques fairs may have travelled a long way, and will often not have a shop of their own. With a bit of luck Dordogne-dwellers will have a range of choice far greater than normal. Be aware that the person selling to you may not be particularly concerned if you're not happy with the result. He'll be miles away by the time you've decided you want your money back. So you need to be careful. Hints for being a successful "chineur"
If you want to buy something, get to fairs as early as you can. The best items will have gone by eleven o'clock. Don't be in too much of a rush. Try to have either a budget or an idea of market value by having looked at similar items. Don't spend more than you feel is fair. Haggle, haggle, HAGGLE!. In France the initial discount proposed is more of a token. Hang in there and don’t be intimidated! Don’t be frightened of walking away if either on closer examination the item's not what you want, or the price is seriously more than you want to pay. - just as in shops, start off with the obligatory "Bonjour" - this is no more than a way of opening proceedings, but it'll seem rude if you go straight in with your questions. - "c'est combien? ", pointing at the relevant piece, will get you the price. If you don't understand French numbers, ask the dealer to write it down. - "de l'époque" means "period" - a vague term, meaning the item isn't reproduction. However, the precise period may be uncertain - particuly since country cabinet-makers continued making furniture in the old styles for decades after the relevant period. - "votre meilleur prix" means "your best price" - i.e. the best price that the dealer can offer. - "c'est trop cher" means "it's too expensive", and just might provoke a loud protest, or a shrug of the shoulders. - "j'y réfléchirai" or "je vais y réfléchir" means "I'll think about it". - "je reviendrai tout à l'heure" means "I'll come back shortly". Some of these tips may be useful on your next jaunt to the French countryside. Of course, if you don’t have a trip planned soon, don’t despair!! Keep your sights on Je Suis Mignonne or stop by the store for regular visits. I’m out there doing a lot of the hard work for our customers so they can enjoy some of those beautiful French treasures that just can’t be found locally in the States. We are committed to bringing you unusual glassware, décor and collectible items at fair prices to enhance your home. At Mignonne, we revere treats that can stand the test of time. We were attracted to the Claus Porto line because of the traditions they have sustained through the years. 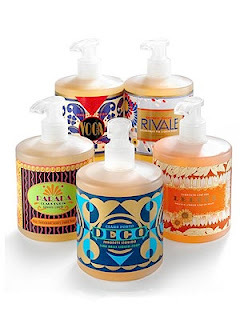 Like their revival of their original Art Deco designs utilized not just on their packaging but in the etched glass housing their unique candles. Or their oversized cakes of soaps in tantalizing fragrances. Or the rich textures of their body products. The oldest and most prestigious soap making factory in Porto, Portugal, Claus Porto was founded in 1887 by two world renowned chemists: Ferdinand Claus and Georges Schwedder. Together they created the base for what was to become one of the most important soap making factories ever. Famous fragrance and fashion houses in France, England and Spain came to Porto to have all of their soaps made by Claus Porto. The factory today is still family owned and run by the great grandson of Achilles de Brito. 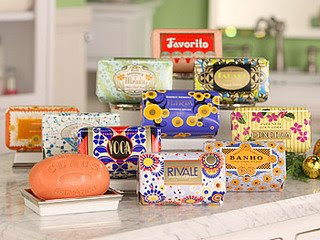 At this 117 year old company, the family continues with the great soap making traditions that were a matter of honor for the original founders. Many companies use modern automated methods, and lower quality ingredients for one simple reason: to make more product in a less expensive fashion. At Claus Porto, it is just the opposite. The time - honored tradition of milling seven times (milling refers to the process of ""mixing"" the soap; the more times that the soap elements are passed through the mill, the more air bubbles are forced out of the mix and the more the fragrance is evenly distributed) has remained to this day the secret of the success of their soap line. Milling seven times createss a dense, hard soap that is fragrant down to the very last bit, without splits or cracks and with a rich creamy lather. All of the soaps are naturally air - dried (as opposed to hot air machines which dry other soaps on the outside, leaving them soft and gooey on the inside and eventually causing them to crack and melt down after being used) on racks for two to three weeks, ensuring an even, consistent bar. These luxurious and creamy bars are made with coconut oil and enriched with 2% shea butter to moisturize, protect, and replenish the skin's natural protein complexes. The highest quality fragrances from the south of France are used to create the exotic, lingering scents that have made these soaps so famous. Claus Porto Liquid Soap is a 100% vegetable based formula which contains wheat proteins and aloe vera. Claus Porto candles contain clean-burning soy wax in a 10.5-ounce glass holder with an etched motif that matches the art deco styling of the packaging. Candles have an approximate burn time of 70 hours. We vary the Claus Porto offering seasonally, so stop by soon to see which items we have in store for you. Of course, if there's something special we can order ... let us know. And as always, we carefully wrap and ship items around the world. 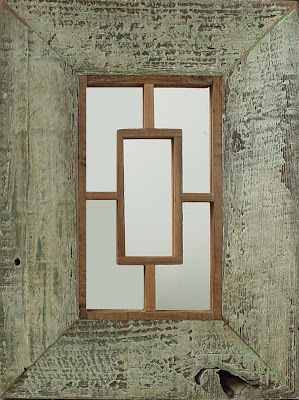 We are pleased to offer Billy Kroft's unique furniture pieces and mirrors at Mignonne. His work can be defined as "art carpentry". Billy elevates reclaimed and scrap wood into form and function. At Mignonne, we have Billy's smaller, decorative mirrors as well as grand mirrors in large dimensions created from reclaimed wood and mirror glass. Billy also creates furniture, such as tables, benches and the like. He is sometimes available for custom pieces as well, which we can happily coordinate. Billy's work is beautiful, sustainable and imaginative. Stop by soon and have a look! Quality Toys, Handmade in France! Here at Mignonne, we wanted to offer a quality toy that came with peace of mind for parents and gift givers alike. A toy that could be presented with confidence and security. And that is why we chose Vilac, a trusted brand. Deep in the heart of the Jura surrounded by mountains, lakes and forests, between Champagnole and Saint-Claude, Vilac has been manufacturing wooden toys in Moirans-en-montagne for more than 80 years. 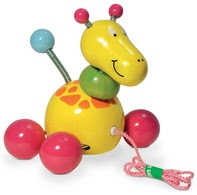 Vilac toys are unique, never go out of fashion and have lasting appeal for all generations. Toy-making secrets: the wood is turned, smoothed, sanded and lacquered by our skilled craftsmen at Moirans-en-montagne. The toy designers are veritable artists who give personality and character to our toys. Vilac means "Jura" just as it means "wood". Vilac toys are ageless. Well, at least since 1911.